REGINA -- Saskatchewan's Provincial Capital Commission is calling on Regina police to remove a growing number of teepees set up in protest outside the legislature to make way for a Canada Day concert stage and beer gardens. Executive director Carrie Ross said in a statement on Wednesday that late adjustments are needed for Canada Day festivities in the popular park surrounding the provincial building. "It is disappointing that last minute changes are necessary to an event that requires year-round planning because of an unpermitted and illegal protest," Ross said. 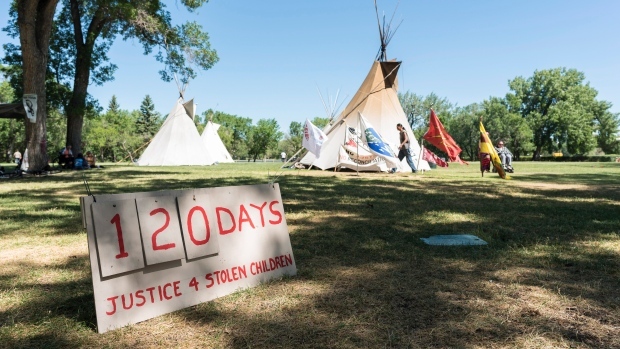 The Justice for Our Stolen Children camp was erected to protest racial injustice and the disproportionate number of Indigenous children apprehended by child-welfare workers. The camp started in late February and was dismantled last week before being set back up on Thursday. There was originally only one teepee at the camp before it was taken down by authorities. The new camp had eight as of Wednesday morning. Protester Robyn Pitawanakwat said the space the teepees are currently occupying is usually home to a beer garden on Canada Day. She added that Canada Day is a sore point for protesters because celebrating Canada's formation legitimizes the displacement of Indigenous people. "The establishment of the state of Canada was the major step in our genocide," Pitawanakwat said. "And I don't just mean cultural genocide, I mean actual deaths of our people. There's nothing to celebrate for many of us in that." Pitawanakwat said protesters have a meeting with the provincial government on Monday in the town of Fort Qu'Appelle, but the request from the commission suggests the government is entering the talks in bad faith. "We are hopeful that this meeting will go through, but we'll see," Pitawanakwat said. "When we're sitting at the table and they arrive on the other side, then we'll know." Regina Police Chief Evan Bray said that his force assesses the protest multiple times a day and doesn't believe there's currently a risk to the public. He's hopeful for a peaceful resolution. "Right now, our focus is community safety," Bray said. "We don't feel a police response at this point, especially knowing that there is a meeting and a discussion planned in under a week from now, that a police response would do anything to help that." 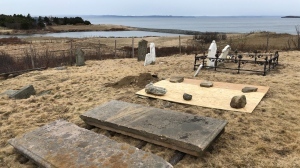 The Provincial Capital Commission said that bylaws prohibit overnight camping, placement of structures and burning wood and other combustibles. Pitawanakwat said that police have listed safety concerns, but that she feels safe at the camp with her three children. "There's absolutely a safety here that doesn't necessarily exist outside of this space," she said. "There's been the implication by the police that there are safety issues with us being here because a lot of rednecks that drive up and down the street. Those rednecks are everywhere here." She said it's premature to discuss how long the camp will remain. The Canada Day celebration has been held in the park for at least 40 years and attracts over 25,000 people each year. Campers are planning a "trespassers powwow" on Saturday as a pre-Canada Day celebration with a concert afterwards. Protester Prescott Demas said he's hopeful about meeting with the government. "There's no guarantees that anything is going to happen from this meeting," he said. "This meeting is here to open the dialogue and start conversation. Wherever it goes from there is wherever it goes."